Low Profile Transformers- 6VA to 12VA. 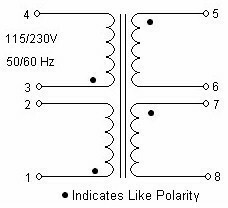 Voltages include 10V, 12V, 16V, 20V, 24V, 30V, 34V, 40V, 56V, 88V, 120V, 230V. Dual 115/230VAC, 50/60Hz Primary. Isolated Step-Down Transformer, non-concentric windings provides High Isolation. Non-concentric windings, Low capacitive coupling, no electrostatic shield needed. UL/CUL/CSA approved and CE marked.